A 22-year-old who was set alight last month at an anti-government protest in Venezuela's capital Caracas has died. 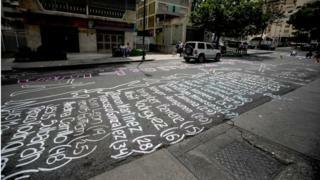 Photographs had showed the man, Orlando Figuera, surrounded by an angry crowd in the Altamira district. On Friday prosecutors said suspects had been identified. President Nicolás Maduro has said the victim was set upon because he was a government supporter. At least 60 people have been killed in protest-related violence since the beginning of April. Warning: This article contains an image that readers might find disturbing. In one picture, a masked man can be seen pouring petrol over Mr Figuera, who was kneeling on the ground at the time. Another photograph seems to show another masked man lighting a lighter. Mr Figuera was engulfed in flames. Doctors' reports said he had suffered burns to 80% of his body. Witnesses said the crowd had accused Mr Figuera of being a thief. But President Maduro blamed the leader of the opposition-controlled National Assembly, Julio Borges, for the death of Mr Figuera, arguing that Mr Borges had called on opposition supporters to protest. "Julio Borges is responsible for these crimes because he has led the opposition calls for insurrection, violence and aggression against our fatherland," he said. Opposition politicians in turn blamed the government of President Maduro. Opposition leader Henrique Capriles on Twitter demanded justice for all of those people killed in the protests. Figures from the chief prosecutor's office suggest that at least 60 people have died since a wave of almost daily anti-government protests began on 1 April. Rival pro- and anti-government rallies are planned for later on Monday.